27 steps to prevent computer virus/Trojans. 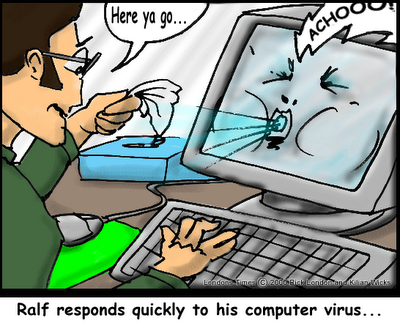 Read on to be aware of the 27 steps that will help you prevent your PC from getting infected with those deadly viruses. Some of these steps are common but many of them are not so common. So read carefully and stay protected. 1.Always be careful when it comes to e-mails that have attachments. If files contain EXE, COM or VBS as extensions then they are most likely able to cause harm to computers. Do not open it. 2.Do not open attachments when they are from people you do know, if the mail does not clearly refer to them. If they have a virus, then it can send mails to you. Therefore, only open attachments of which it makes sense to refer to. 3.Do not open video files from sources you are not sure. The new way of sending viruses is by using video files. It has already started so watch out for it. It was only recently that Anti-virus firm McAfee warned Windows users that the company had discovered a worm, dubbed W32/Realor, actively infecting Real Media files. The infected video files do not contain an exploit for the RealOne or Real players, but a hyperlink that points to a malicious website. It could be just the beginning to a new way of virus distribution. 4.While talking over the messenger use the file transfer option only if it is necessary and if you know the person at the other end well enough. Even if the person is known to you his computer might be infected with a virus. So make sure he too has an update anti-virus on his PC. 5.If a friend sends a file over the messenger do not open it unless it is the file you and your friend is sure is not infected. 6.Never dowload files send by unknown people. 7.Always have an up to date version of your messenger. 8.Be careful when trading any kind of files through your messenger or by any other means. 9.Always scan files on floppy disk or zip disk before using it. As you know an infected file from a disk that you have borrowed or which have been used on some another computer which has been infected can infect a clean PC. 10.Often attachments sent from a Mac will have not have any extensions. So in that case it is not possible to tell the type of the file. So as a precaution do not open attachments that has no extensions at all. 11.Always check the file extensions of any file arriving from a source.To see the file extensions Open Windows Explorer or My Computer. On the menu, choose View > Options to open the Options dialog box. If there is a View tab, click it. If there is not View tab, click the File Types tab. Then uncheck (by clicking its checkbox) "Hide file extensions for known file types." Click OK to close the dialog box. Usually by default windows does not show extensions. But once you checked the file extensions go back and hide the file extensions. 12.Even a picture file can be infected with a virus or Trojan. In 2004 a picture posted on the Usenet was infected with a trojan. It exploited the Internet Explorer. All the Antivirus programmes are capable of dealing with it now. But you never know what is in the making. Since it has been proved that it is possible it is good to be on the safer side. Any picture that floats in email or any unfamiliar sites which entices you to view it should be dealt with caution. Even though now a days a picture spreading a virus is only a remote possibility, the very reason that it is possible is a scary thing. 13.Word documents (.doc), Excel documents, and other files can contain macros that functions as viruses. But now a days all AntiVirus checks for these. But still excercise caution when it comes to unkown sources. A well known macro virus was the melissa virus and the cybernet virus. 14.Sometimes the virus warnings themselves are a farce. So think again before you start spreading the word or press the panic button at your end. Many reports of viruses are hoaxes. Many of these arrive through emails and instant messages. So if you have a doubt and before dealing with those kind of viruses double check it. The sites listed below are the ones you can use to verify a hoax message before you make sure they are for real. If you don't find them there google it. F-secure's virus hoax related page. 15.If you download a file from popular sites like Rapidshare before downloading look at the link and if you see the extensions like .exe, .scr, .bat etc:- be warned. SOmeone might load a file at Rapidshare or similar popular sites and spread the word luring you to download it. Or even after you download the zip or rar files look for the extension of the file it contains and scan it. If the extension sound fishy never touch it. For example a movie file with a .exe extension. 16.The file types that are the most dangerous are the files with the .exe, .com, .scr, .vbs, .cmd, .bat and .reg extensions because they contain programs and not documents. Take note of that and keep it in the back of your mind before opening it. 18.Don't visit warez sites especially key generators. A very small KB file that comes as a key generator once clicked can easily open up a can of worms or viruses. 20.Excercise proper caution when using your personal disk space (e.g., floppy disks) on public computers or other computers that are used by more than one person. 21.Always running your Windows computer as an administrator or power user is not advised. A programme downloaded and executed when you have the administrator priveleges can even go to the root. 22.One of the ways to ensure that you don't get a rootkit virus is by accepting only digitally signed drivers. 23.Even AntiVirus softwares can have vulnerabilities. So always check for the latest news about the Antivirus software you are using. Very recently (nov.16 06) one of the top Antivirus progs, Panda, was found to be having highly critical vulnerabilities by the security firm Secunia. See the report here. 24.Remember Trojan.Bakloma.A. virus that came out in August 2006? If not let me refresh your memory. A link in the email claiming to be from Norton(Symantec) asked the users to download a removal tool for a new virus by following the link. Immediately as the user went to the site that was linked the virus Trojan.Bakloma.A. was automatically downloaded. So watch out for emails or suspicious links anywhere that asks you to update your Antivirus by following the link. All good Antivirus progs allows you to update through the software installed on your pc. 25.Use a firewall,Anti Spyware, Anti-Trojan, Anti-Virus and Anti Rootkits and update it everyday if possible. 26.Regulary update security patches from your browser and Operating system vendor. What are Rootkit viruses and free RootKit detecting softwares.